United States is feeling the consequences of recession and more rural countries like Nevada are among worst hit areas. Many believed that a salvation from recession came from a German developer, Solar Millennium who last year famously announced plans to build two large solar farms (Nevada is one of the sunniest U.S. states) that would harness the sun to generate electricity, and in process create hundreds of jobs for people that lost their jobs because of recession. But then all of the sudden things became problematic because of the water use. 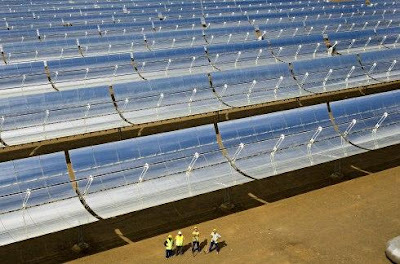 The Germans announced that its preferred method of cooling the solar power plants would consume 1.3 billion gallons of water a year which equals about 20 percent of this desert valley’s available water and would very likely cause water shortage. However the public opinion in this matter is still not united. Some are looking forward to this hoping to make money by selling water rights to the company while others are concerned about not only the facts that this project could result in water shortage problem, but also what this project is going to do Nevada's environment. Many people accept renewable energy as something that is flawless but everything in this world has its flaws, and so does the renewable energy. One of these flaws is definitely demand for huge amount of water. Many of the proposed solutions to the nation’s energy as well as environmental problems in form of certain types of solar farms to biofuels refineries to cleaner coal plants, windmills, could consume billions of gallons of water every year, and water is as many of you know the most precious resource on this planet. Water is big problem for new solar projects in Nevada. Water could very easy become major hurdle in renewable energy development, not only in United States but globally too because renewable energy and water are in many cases very closely connected. Conflicts over water could undermine the future of many renewable energy projects so don't expect this Nevada's project to be just an exception. Therefore the most likely to succeed are most water-efficient renewable technologies that could use water shortages could give them a competitive edge over cost effectiveness. If we take a look at California we can see that many solar developers have already been forced to switch to less water-intensive technologies because local officials were worried about potential water shortages and therefore not giving them green light to go with projects. And many other big solar projects across the country are also having problems over water consumption with local communities. Joni Eastley, chairwoman of the county commission in Nye County, Nevada, which includes Amargosa Valley, said at one hearing that her area had been “inundated” with requests from renewable energy developers that “far exceed the amount of available water.” Local authorities definitely do not want to gamble with the question of water, and this is where all troubles are starting. Many of these new solar energy projects include building solar thermal plants because this is cheaper technology compared to the solar panels we could often seen on roofs on some buildings. 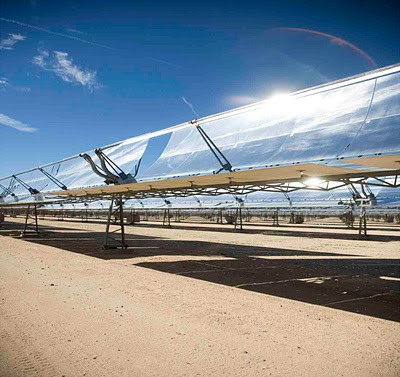 Solar thermal plants are specific because they have mirrors that heat a liquid to create steam that afterwards drives an electricity-generating turbine. Here is used the same principle as in the fossil fuel power plant, namely that the steam must be condensed back to water and cooled for reuse. The conventional method uses so called „wet cooling“. The working principle is as follows: Hot water flows through a cooling tower where the excess heat evaporates along with some of the water so the water has to be replenished constantly. An opposite procedure called „dry cooling“, uses fans and heat exchangers, basically the same thing as the car’s radiator. Dry cooling needs far less water, but has big disadvantage in high costs and reduced efficiency, so many energy companies driven by profits at the end decide for wet cooling projects. But the water issue could put much more emphasis on dry cooling projects and the ones that could profit the most are definitely photovoltaic power plants. Photovoltaic power plants are typically more expensive and less efficient than solar thermal farms but require a relatively small amount of water, mainly to wash the panels, and this could turn out to be their big advantage in years to come compared to projects like Solar Millennium. California is U.S. state that mostly uses solar energy .California's current plans include 35 large-scale solar projects that should be enough to generate 12,000 megawatts of electricity, which is output equal to about 10 nuclear power plants. These projects would of course use water, some less, some more, and this could also turn out to be problem in upcoming years. Some projects wouldn't use as much water like for instance BrightSource Energy’s dry-cooled Ivanpah project in Southern California that would consume an estimated 25 million gallons a year, mainly to wash mirrors. If all projects were like this then there wouldn't be a big deal about it but some projects like for instance wet-cooled solar trough power plant that is barely half Ivanpah’s size and was proposed by the Spanish developer Abengoa Solar would draw enormous 705 million gallons of water in an area of the Mojave Desert that already very rarely receives rainfall. Publicly most known dispute is the dispute over a proposed wet-cooled trough plant that NextEra Energy Resources, plans to build in a dry area east of Bakersfield, California. NextEra wants to tap freshwater wells to supply the 521 million gallons of cooling water each year to the plant, despite a California's policy against the use of drinking-quality water for power plant cooling. This issue has become so big that has even moved into the California Legislature, where a special bill has been introduced to allow renewable energy power plants to use drinking water for cooling if certain conditions are met. Water disputes have already forced Solar Millennium to abandon one of their wet cooling projects that was intended for a solar power plant in Ridgecrest, California, after the local water district refused to supply the 815 million gallons of water a year the project would need. The company at the end decided to dry cool two other massive Southern California solar trough farms it wants to build in the Mojave Desert to avoid further disputes with local communities. The words “we will not do any wet cooling in California because there are simply no plants being permitted here with wet cooling.”, that Rainer Aringhoff, president of Solar Millennium’s American operations said are really the reality of future solar energy projects in California, and many expect the same in Nevada. This doesn’t many that things will go smooth for solar projects that use less water as even solar projects with low water consumption face hurdles. For instance Tessera Solar is planning a large project in the California desert that would use only 12 million gallons per year, mainly to wash mirrors. But because it would draw its water upon a severely depleted aquifer, Tessera will probably have to buy rights to 10 times that amount of water and then retire the pumping rights to the water it does not use. To avoid all of this, Tessera has agreed to fund improvements to a local irrigation district in exchange for access to reclaimed water because they have to find water to continue with their projects even though they are low water users. Water is particularly scarce in American west, and even big energy demand can't at this point justify enormous use that some solar energy projects would require. Yes these projects would likely create thousands of new jobs for local population, and would help relieve the consequences of recession, but would cause even bigger water scarcity across these mostly desert areas. Finding balance between need for new renewable energy projects and new jobs and scarce water resources on the other side won't be easy even in this early stage of solar energy sector development whether alone when U.S. would start getting 20 or more percent from renewables. Water is not a problem in some parts of Nevada. 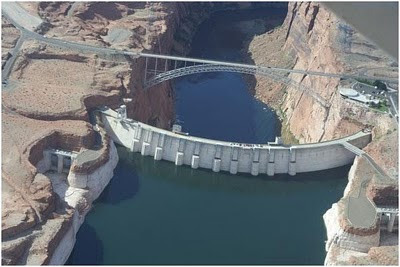 Hoover Dam on Colorado River. Water could soon turn out to become the most precious resource in the world so future renewable energy projects would definitely have to ensure working principles that would use far less water in order to be successful. Yes we definitely need energy from renewable energy sources but we much more need water that is key ingredient to all life on our planet. Science and technology would definitely have to work hard to ensure new working principles for renewable energy projects or otherwise these new energy projects will have even bigger price that currently fossil fuels have. Yes fossil fuels do pollute the planet but at least they do not need so much water to operate, and big renewable energy projects will need to show much more than their ecological component to become fully acceptable. Many prominent people in U.S. believe that era of water scarcity awaits America in years to come and the least thing we need is energy projects with massive water consumption. Scientists have recently stated that in San Diego within the next 13 years Lake Mead and Lake Powell along the Colorado River, the two largest reservoirs in the southwest United States, could become “dead pool” mud puddles due to climate change, population growth, and profligate use. In California for instance California Governor Arnold Schwarzenegger declared a statewide water emergency, and Nevada isn't looking much better so really the last thing that U.S. needs are largely water consuming renewable energy projects. Don't get me wrong I'm pro renewable energy project but only if their price isn't too high, and since we are here talking about enormous amounts of water, their price is definitely too high.